(CNN) -- Pope Benedict XVI refused Wednesday to soften the Vatican's ban on condom use as he arrived in Africa for his first visit to the continent as pope. 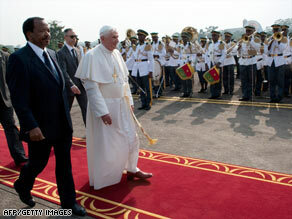 Cameroonian President Paul Biya, left, walks with Pope Benedict XVI at the airport in Yaounde, Tuesday. He landed in Cameroon, the first stop on a trip that will also take him to Angola. The pontiff reiterated the Vatican's policy on condom use as he flew from Rome to Yaounde, the capital of Cameroon, CNN Vatican analyst John Allen said. Pope Benedict has always made it clear he intends to uphold the traditional Catholic teaching on artificial contraception -- a "clear moral prohibition" -- Allen said. But his remarks Tuesday were among the first times he stated the policy explicitly since he became pope nearly four years ago. He has, however, assembled a panel of scientists and theologians to consider the narrow question of whether to allow condoms for married couples, one of whom has HIV, the virus that causes AIDS. It is still not clear how the pope will rule on the matter, said Allen, who is also a senior correspondent for the National Catholic Reporter. The Catholic Church has long been on the front line of HIV care, he said, adding that it is probably the largest private provider of HIV care in the world.